At the onset of the Civil War the Regular Army Corps of Engineers had only one company of enlisted soldiers stationed at West Point. The force size was gradually increased to eight companies, but even this force was small relative to the needs of the service. Several volunteer regiments were designated as Engineers. The best known of these were the 1st, 15th, 50th New York Engineer Regiments, the 1st Michigan Engineer Regiment and 1st Missouri Engineer Regiment (Bissell's Engineer Regiment of the West). There were also a number of independent companies designated as Engineers. The apparent lack of engineers was compensated for by the fact that West Point was as much an engineering school as a military academy and its graduates regardless of branch were capable of detailing their own troops to built common structures, such as bridges, shelters or fortifications. Also, entire infantry regiments were detailed for larger projects. Such labor was not popular with soldiers who believed they joined the army to fight, but most of them had worked in farming and the tasks were familiar ones. The two above soldiers are colorized ones from the 1866 Quartermaster photograph collection, taken to illustrate the appearance of period uniforms. The Corps of Engineers private is wearing a dress uniform. His Jeff Davis (Hardee) hat has a brass Corps of Engineers castle and his company letter on the front. Privates wore one ostrich feather. His coat is a regulation 9-button frock. The buttons on it were general service eagle buttons. Only officers wore Corps of Engineer buttons during this period. He is wearing shoulder scales. His piping is in yellow, a color generally associated with cavalry but also used by enlisted engineers. 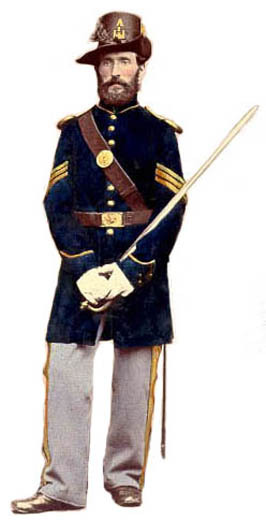 Cavalry troops wore a jacket rather than a frock coat. Branch colors were not specific at the time of the Civil War and the Corps of Engineers would not get its scarlet and white colors until 1902. Yellow did not appear as a branch color on the uniforms of officers of the Corps of Engineers. On his sleeve is a 5-year service stripe in yellow. He is wearing accoutrements and holding a model 1861 Springfield rifle musket. His trousers are light blue. The sergeant is dressed in a similar fashion. He is pictured with a regimental number on his hat, which in all likelihood would only have been worn by the volunteer engineer regiments since the Regular Army troops were not organized into a regiment. He wears a sword belt and holds a Model 1840 noncommissioned officer's sword. On his trousers are one and one-half inch stripes in yellow.